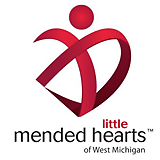 Catalyst Radio - "Mended Little Hearts"
Host Jessica Gladden speaks with Jennifer Dougherty and Mary Hobson from Mended Little Hearts of West Michigan, a support program for parents of children and adults with heart defects and heart disease. Learn more about how their volunteer based program supports the community and about their upcoming event, the Funky Heart 5K, on September 24. Contact them through their Facebook page at https://www.facebook.com/MendedLittleHeartsOfWestMichigan/ .